I’m really proud to announce the first release of the Socket.IO C++ Client on GitHub! Based on Boost and WebSocket++, this full-featured Socket.IO 1.0 client has the fundamental advantage of working on multiple platforms. Check out the directory of examples. It contains examples of iOS, QT, and CLI chat clients! To learn how to use this client, I put together a QT chat example that communicates using a Socket.IO Node.JS chat server. Keep reading for step-by-step instructions. Send messages to all users joining the room. Receive a notification when users join or leave the room. Receive notifications when a user starts typing a message. Before you get started, visit the QT community to download and install QT. 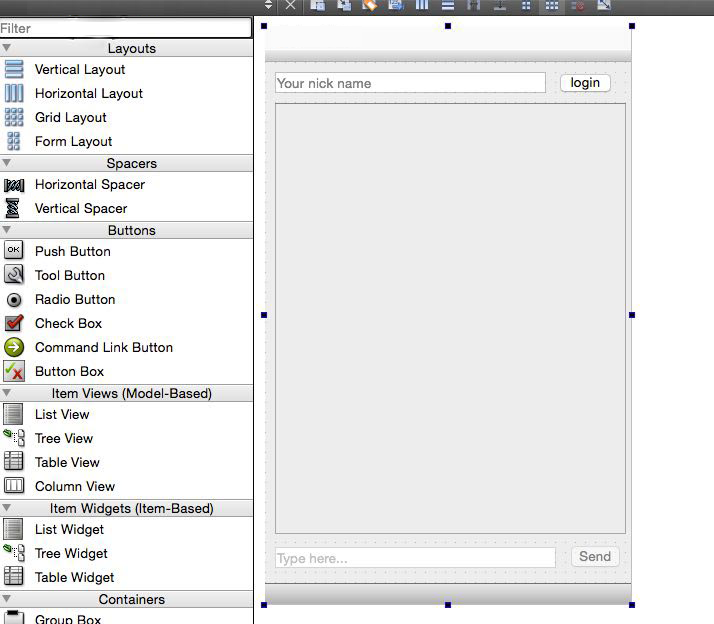 On the welcome page, select New Project, then create a QT Widget Application. Name it SioChatDemo. Lets copy the SioClient into the QT project under the subfolder sioclient. The no_keywords flag prevents qmake from treating some function names as emit as the keyword for the signal-slot mechanism. Use c++11 to ask for C++11 support. We now have our boost headers and a fat boost static lib named libboost.a(non-win32) or boost.lib(win32). Create a simple UI by dragging and dropping a widget from the widget box on the left-hand side. Open mainwindow.ui in the design mode. Switch to the signals/slots mode using Menu->Edit->Edit Signals/Slots. Click and hold the widget and drag it to the window (the cursor will become an electrical ground symbol) to open the connection editor. In the connection editor, edit the main window slots on the right side. Add the slot function names added in mainwindow.h before. 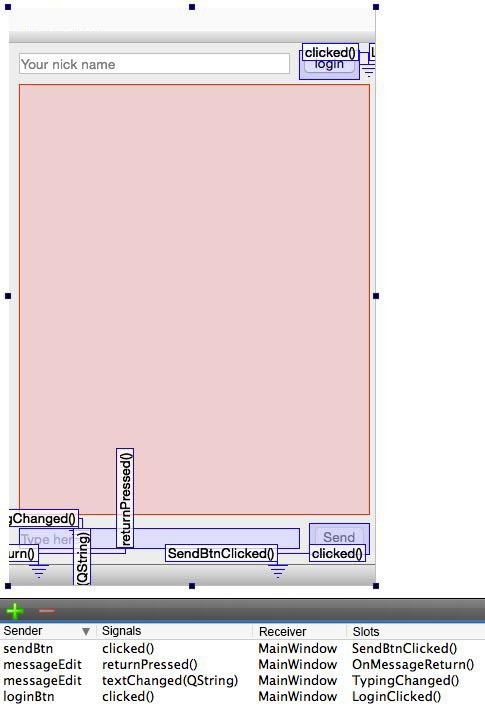 Then connect them in the MainWindow constructor. For single-window applications, simply let MainWindow class hold the sio::client object by declaring a unique_ptr member of the sio::client and several event handling functions in mainwindow.h. Initialize sio::client and setup event bindings for the default socket in the MainWindow constructor. We also need to handle connectivity and disconnect events. //default socket opened, also we have "set_open_listener" for monitoring physical connection opened. //physical connection closed or drop. //physical connection fail to establish. We have several connection listeners for connection events. First, we want to send a login message when were connected; we get the default socket from the client to do that. If the connection closes or fails, we need to restore the UI before we connect. If we exit the MainWindow, we need to clear the event bindings and listeners. The sio::client object will be destroyed using unique_ptr. We’ll need to handle socket.io events in our functions they are bound to. For example, we need to show received messages in the list view. //so that 'AddListItem' will be executed in UI thread. When sendBtn is clicked, we need to send the text in messageEdit to the chatroom. You can run the demo project to get a closer look. Before you run it, please follow the instructions to make the Socket.io client library. Don’t forget to star the project on GitHub to get updates!